Seedball making team ! Questus at Hunters Point Community Middle School with HarborLAB. HarborLAB and friends from new sponsor Questus shared a wonderful day improving the ecology of Hunters Point and enhancing the environmental science programs of Hunters Point Community Middle School. The students made the day even sunnier, and we got so much done! We started the day by continuing HarborLAB’s work to turn our launch on the Newtown Creek Superfund site into a green and welcoming habitat area and orchard. We planted more shadbush and tended to our orchard trees, built up fresh and composting soil cover on our sloping bank, cleaned the shore, and gathered pokeberries for our seeding program. Questus Co-Founder Jeff Rosenblum joined HarborLAB Facilities Manager Patricia Erickson in revamping our water access, preserving our dock and replacing — and better securing — our ladder. They did a stellar job! The rest of us headed over to Hunters Point Community Middle School with a wheelbarrow of supplies to make seed balls! Our partners were Mary Mathai’s special needs science students and the school’s Eco Club. The students were delightful, and Ms. Mathai, other faculty members, and Principal Sarah Goodman have been amazing partners with HarborLAB since before the school even opened! 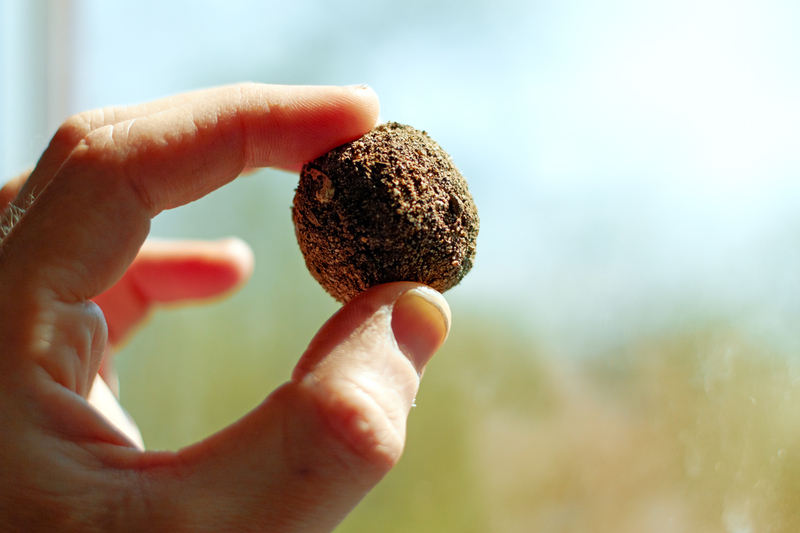 Seedballs are an efficient way to distribute seeds with a nutritive soil head start, whether for agriculture or habitat strengthening. 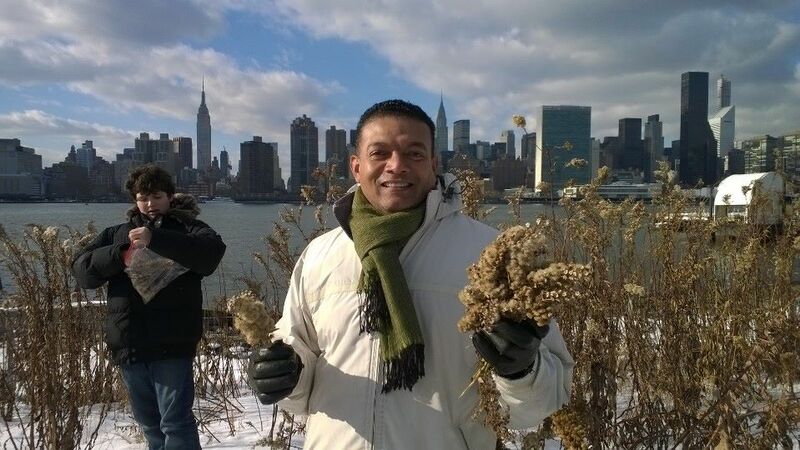 HarborLAB got its start through lessons provided by the NYC Seedball community. We make our seedballs from powdered red clay, compost, cocoa shells, a pinch of sand, and seeds gathered from indigenous shoreline plants. Our Hunters Point Eco-Day seeds were seaside goldenrod gathered by Hunters Point Community Middle School students last year. Goldenrod is a vital part of our estuary, sustaining butterflies and other beneficial insects and sheltering the nests of black skimmers, one of our most unusual shorebirds. The HarborLAB and Questus team worked with the students in two sessions, with two or three adults to a table. 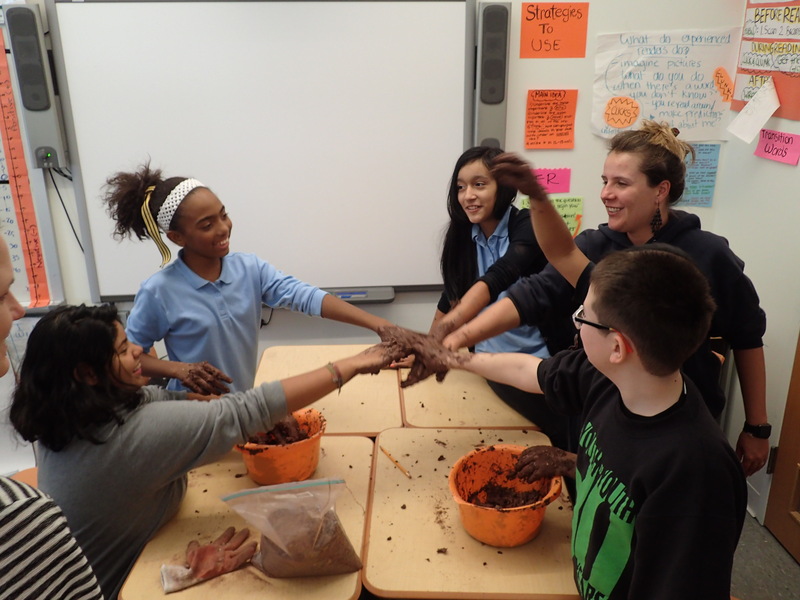 The group effort produced thousands of seedballs and the kids will use up leftover material next week. This activity and our illustrated presentation reinforce curricular lessons about the purposes of flowers, fruits, and seeds, and how seeds are distributed in nature. 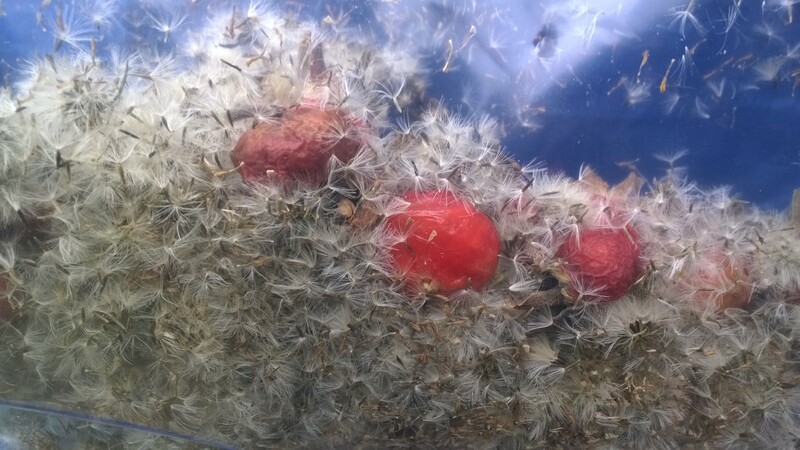 Seedballs replicate frugivorous endozoochory, or how animals spread seeds, packaged in dense nutrition, through their droppings after eating fruits. When students gather seeds with us, they learn how to identify plant species and about how plants support other species and stabilize shorelines. We also discuss, of course, how plants can remove CO2 from our air to reduce climate chaos and ocean acidification. All spring and summer, HarborLAB volunteers and students distribute seedballs as we paddle shore to shore, under the direction of conservation groups and park and preserve authorities. 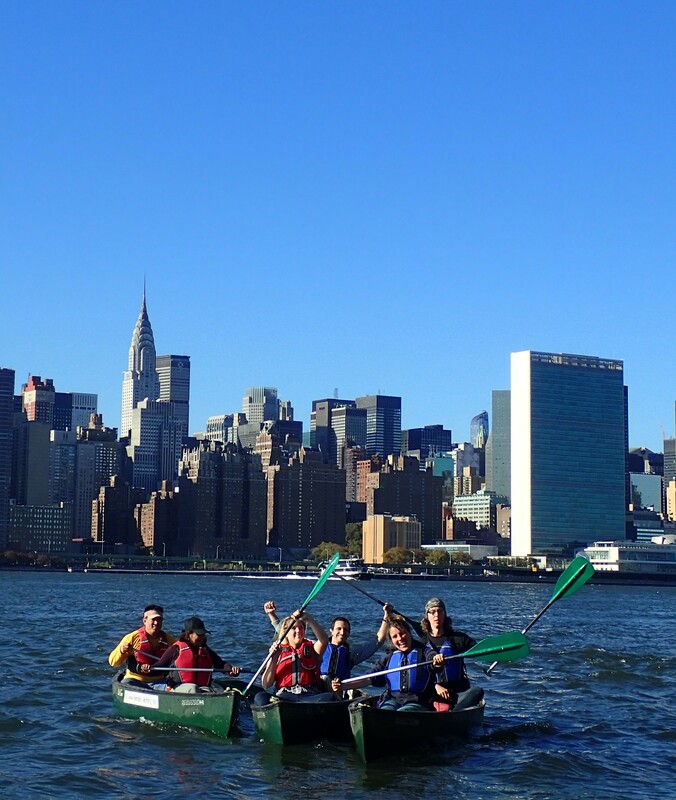 The Questus team also enjoyed peer bonding, diving into a delicious lunch provided by COFFEED LIC Landing in Hunters Point South Park and canoeing from the HarborLAB GreenLaunch to the mouth of the Newtown Creek on the East River. In both cases they were exhilarated by Manhattan skyline views. We’re deeply grateful to Questus’ team for their support and camaraderie, and to the students and faculty of Hunters Point Community Middle School for their spirited engagement in education to meet our world’s ecological challenges. Goldenrod seeds and rose hips bearing seeds. Photo by Erik Baard. HarborLAB is blessed with 125′ of waterfront facing southeast. That makes for bad sunburns but a vibrantly growing ecosystem! We’re increasing our bounty of flowering and fruiting plants (mostly indigenous), and sharing it with the estuary as a whole through seed gathering and propagation. We choose species that naturally stabilize shorelines and support wildlife. We thank our sponsors, allies, and partners in this project: Citizens Committee for NYC; New York State Office of Parks, Recreation, and Historic Preservation; NYC Department of Parks and Recreation (Greenbelt Native Plant Center); Hunters Point Community Middle School; Hunters Point Parks Conservancy; CUNY LaGuardia Community College; Briermere Farms, and more coming soon! We’re especially dedicated to creating Monarch Butterfly habitat by growing milkweed, goldenrod, beach plums, shadbush, and pokeberry. This program is the kind of kid-friendly, affordable contribution a small volunteer group can make to the environment and education, and have a big impact!